A Greener Convention, A Greener Future? 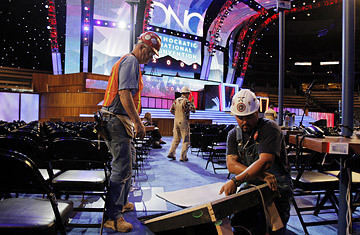 Electricians connect power cable as preparations on the floor of the site of the Democratic National Convention in Denver. Hot air from the speakers notwithstanding, the Democratic Party has promised that its national convention in Denver will be the "greenest" one ever. The party is working to offset the carbon dioxide that will be produced by more than 6,000 delegates traveling to the Colorado capital, with prizes offered to the delegation that can reduce emissions the most. The convention's fleet of official cars will use flex fuels  a mix of gasoline and less carbon-intensive biofuels  and 1,000 bicycles will be available for use free of charge. The main stage in the Pepsi Center will be built out of sustainable wood and recycled materials, and the arena itself will offset the electricity it uses with wind power. Democratic National Convention Committee (DNCC) workers won't even have trash cans in their offices  to encourage them to recycle. But some of the greenest programming in Denver will come not from the convention itself, but from a long-running Colorado radio show called Etown, whose hosts, Nick Forster, a bluegrass musician, and his wife Helen, a singer and actress, mix music with environmental talk. Launched in 1991, Etown started small, as an independent program broadcast from the university town of Boulder, Colo. Today, the show has over one million listeners and is carried internationally by National Public Radio. As a sign of its influence, on Aug. 26  the second night of the convention  Etown will hold a special concert in Denver's Temple Hoyne Buell Theater, with artists including James Taylor, David Crosby and Ani DiFranco. "The show, in many ways, will capture the essence of this year's Democratic National Convention," says Helen Forster. "It's about change and the exchange of ideas, and that's something we've been facilitating through Etown." Nick Forster had the idea for Etown in 1990, when he returned to the U.S. after touring in Eastern Europe. The environmental devastation he saw there  the legacy of communist misrule  inspired him to do something to stem the tide of climate change. He realized  given his fundamental belief in the power of live music to bring people together  that a radio show was the answer. On Earth Day 1991 Etown broadcast its first show. "We wanted to build a community through music," he says. "The music was always the hook to bring people in." From the start, Etown was a peculiar hybrid. The Forsters would play bluegrass, folk, rock, and host live performances, then shift into interviewing climate scientists on the frontiers of global warming. Many of the questions came directly from listeners. It was a mashup that in many ways was ahead of its time, especially in its early focus on the intricacies of global warming. "We're like original bloggers," says Nick Forster. "We were building from the grass roots." In other ways, though, Etown feels like a throwback to a time when musicians played with a social conscience and music could effect political change. But what's clear is that show's gradual success mirrors the growth of environmental thinking nationally in the U.S.  a process that might reach a peak at the Democratic Convention, where energy and the environment will be higher on the political agenda than ever before. Ultimately, whether or not delegates offset their carbon emissions or bike around Denver in the August heat will matter less than whether 2008 marks the moment that environmentalism truly enters the electoral mainstream. "We're cautiously optimistic," says Helen Forster. "What we really need is a consciousness shift." If that happens, Etown will provide the soundtrack to a green revolution.